Server time limit is not intended to show up in KOTH as far as I know. Doesn't really make sense either. Shouldn't be a problem in 5CP and PL though. 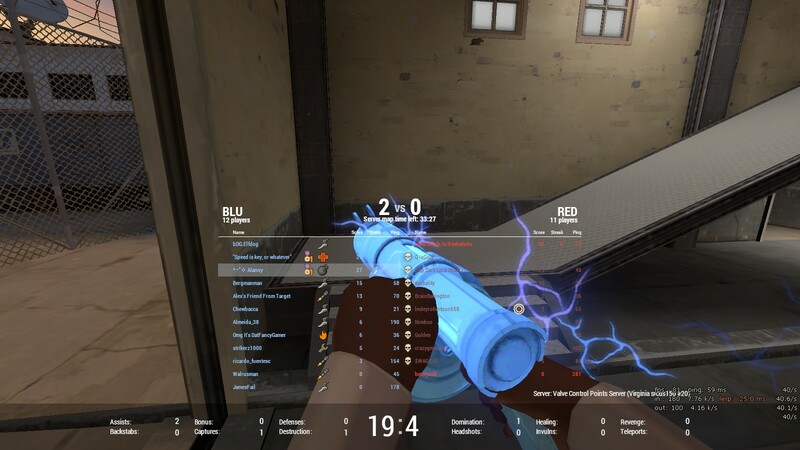 Not really hud related but is there any way to see the MvM elements without actually fufilling the conditions to display them? 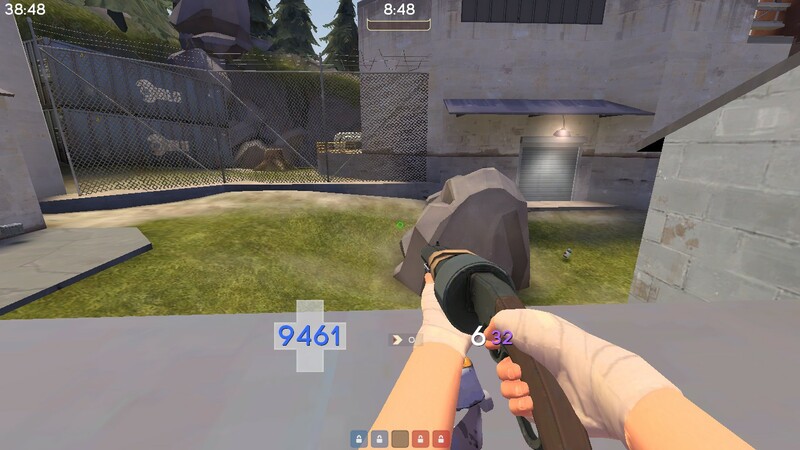 WholegrainNot really hud related but is there any way to see the MvM elements without actually fufilling the conditions to display them? Do you mean the panels such as the loot winnings and such? You could do what I did and recreate them in hudlayout.res, and then use what you've changed into the normal file. omni WholegrainNot really hud related but is there any way to see the MvM elements without actually fufilling the conditions to display them? Do you mean the panels such as the loot winnings and such? You could do what I did and recreate them in hudlayout.res, and then use what you've changed into the normal file. That's a good idea, thanks for the help. How can I disable the notification, that says: "Capture all five of the Control Points to win the game"? Where can I find the file to add the numbers to the spys disguise menu? f_blueServer time limit is not intended to show up in KOTH as far as I know. Doesn't really make sense either. Shouldn't be a problem in 5CP and PL though. I'm designing a hud that helps me use the server time limit to track uber percentages, similar to how quake players use it to keep track of mega/armor timings. Is there a easy way to add avatars and the things that show if your steam friend on your scoreboard? How do I select which menu backgrounds a hud uses? I want it so that only one picture is used as the background. LionxHow do I select which menu backgrounds a hud uses? I want it so that only one picture is used as the background. the file that controls that is chapter_backgrounds.txt, which is located in scripts. these are the contents you would want, you can find the file in yahud or create it yourself. replace background_upward with whatever you want to use. more info here. the file that controls that is chapter_backgrounds.txt, which is located in scripts. these are the contents you would want, you can find the file in yahud or create it yourself. replace background_upward with whatever you want to use. more info [url=http://rebelconquer.net/thread/20920/custom-menu-background-post-steampipe/?page=1#361120]here[/url]. Just a quick bump; does anyone know the files required to fix this? 1) Does anyone know the .res file that controls the taunt menu? I wanna make it look flat or shorter. 2) Is it possible to display the current weapon / slot in place of playermodel? Ex. showing "Grenade Launcher" instead of a 2D or 3D playermodel. I know people use crosshair switcher-esque scripts to show or hide viewmodels, but that's not what I'm looking for. DrJeremy1) Does anyone know the .res file that controls the taunt menu? I wanna make it look flat or shorter. [quote=DrJeremy]1) Does anyone know the .res file that controls the taunt menu? I wanna make it look flat or shorter. Hypnotize DrJeremy1) Does anyone know the .res file that controls the taunt menu? I wanna make it look flat or shorter. Oh well, I'll get it from that default hud respository. [quote=Hypnotize][quote=DrJeremy]1) Does anyone know the .res file that controls the taunt menu? I wanna make it look flat or shorter. Any idea how I can make the console more transparent instead of being just a straight black? I'm having no luck at all in trying to remove this box under the round-timer; if anyone could tell me how to get rid of it, it would be greatly appreciated. FozzlmI'm having no luck at all in trying to remove this box under the round-timer; if anyone could tell me how to get rid of it, it would be greatly appreciated. I'm not 100% on the name of it but I'm sure that visible 0 does nothing to it, you've just gotta put it's xpos or ypos at 9999 or w/e to "remove" it. _Kermit FozzlmI'm having no luck at all in trying to remove this box under the round-timer; if anyone could tell me how to get rid of it, it would be greatly appreciated. ShooshAny idea how I can make the console more transparent instead of being just a straight black? It's one of the background colours in resource/sourcescheme.res. Thanks, but it actually turned out to be ServerTimeLimitLabelBG. What is this called? I need to edit it because sometimes my ammo ruins my ability to see the charge percent. Unfortunately, that var only controls the Y position, so higher the number, the lower on the screen it will be, so use a negative number if you want to move it up. So I found "animations" in hudplayerclass.res, and I also found boxrocket.ttf, which is just like crosshair fonts and wingdings / webdings, in that the letters are actually images of things - specifically, some ammo types and weapons (crowbar, gravity gun, etc.). Has anyone played around with the animations in hudplayerclass.res? Do you think it would be possible to use the boxrocket font with the animations to swap like crosshairs, except they would show whether you're on primary, secondary, or melee? or has anyone come up with something similar besides crosshair colors? So I found [url=http://i.imgur.com/VtoMTYj.png]"animations" in hudplayerclass.res[/url], and I also found boxrocket.ttf, which is just like crosshair fonts and wingdings / webdings, in that the letters are actually images of things - specifically, some ammo types and weapons (crowbar, gravity gun, etc.). DrJeremyHas anyone played around with the animations in hudplayerclass.res? Do you think it would be possible to use the boxrocket font with the animations to swap like crosshairs, except they would show whether you're on primary, secondary, or melee? Whenever you swap weapons to whatever weapon slot, it applies the animation to the player model. So for the primary animation, using your primary weapon will apply the idle primary-weapon animation (or act_mp_stand_primary) to the player model that hudplayerclass uses. It's not a hudanimations_tf.txt-type animation thing if that's what you're asking, so unless I'm missing something no. JarateKingIt's not a hudanimations_tf.txt-type animation thing if that's what you're asking, so unless I'm missing something no. Gotcha, that clears things up a bit, thanks. I guess the last part I'd like answered is whether you can set labeltext in hudplayerclass animations. That's weird, it should be working when you changed those values, da fuq? How can i make this compatible with 4x3 resolution ?. Tried to change values but didn't worked. Do you happen to use mac? Mac can cause this problem with some crosshairs, it just happens with some fonts. If not, your crosshair's font file is messed up. http://imgur.com/75rQmYc Do you happen to use mac? Mac can cause this problem with some crosshairs, it just happens with some fonts. If not, your crosshair's font file is messed up. I do use an iMac , but is there any way to make this Xhair work?